This would help us in pin-pointing the exact problem. NOTE : Don’t forget to turn debugging off after you have solved the error. Known as “White Screen of Death”, it is one of the most common WordPress errors. In this error you will see a blank white screen when you open your Site URL. There can be many reasons for the White screen of death error, the most common being plugin/theme incompatibility. If you are able to access the WP-admin back-end area, then start by deactivating all your plugins. – Now if the white screen error is solved, try activating the plugins one at a time and after activating each plugin check if the site is working properly or not and when you find the plugin, after activating which causes the white screen or Blank screen error to occur, deactivate that plugin. – If after deactivating all the plugins the white screen error still remains, go to the WordPress admin area and activate the default “Twenty Twelve” theme, and check if the white screen error is solved. If you are NOT able to access the WP-admin back-end area. – Access the “wp-content” folder via FTP (using softwares like “FileZilla” etc), and rename the folder “plugins” (e.g to “plugins-old”, “plugins2” etc). This will deactivate all the plugins on your WordPress install. – If this fixes the error, then make a new folder named “plugins” and copy all the plugins from the old folder (with the changed name) to this folder one by one and checking the site for the error after adding each plugin. – If the first step did not solve the error then rename the “themes” folder, this will deactivate your current theme and set “Twenty Twelve” (depending on your WordPress install it could be “twenty thirteen”) as your current theme. The most common cause is a corrupt “.htaccess” file. Other causes : Conflict between plugins/themes, PHP memory limit or even a corrupt WordPress intsallation. – Using FTP clients like FileZilla etc navigate to the WordPress install folder and find the “.htaccess” file and rename it (e.g. “.htaccess_old” or “.htaccess2” etc). – If the error is solved then the problem is your “.htaccess” file. – You can generate a new “.htaccess” file by navigating to Settings–>Permalinks from your WP-admin panel and saving the settings. – The most common cause can be within the “wp-config.php” file. – Another could be due to problems at the web host end, especially if you’re on a shared hosting plan. – Open up the “wp-config.php” file using FTP. 4. Warning : cannot modify headers already sent. – Open up the file that would be mentioned in the error message, and remove all the extra spaces from the file. – Make sure the first characters in the file are “<?php” i.e there are no spaces before it. 5. Briefly Unavailable for scheduled maintenance. – If you perform an automatic update for WordPress, it makes a file “.maintenance” that lets people visiting your site during the update process, know that the site is under maintenance. – If this file gets corrupted or the automatic update fails, the file will remain in the WordPress folder and not get deleted automatically. – Access your WordPress root folder via FTP and find and delete the “.maintenance” file there. 6. Lost the admin password. – First and the most simplest being, when you are at the login page, click on the “Lost your Password” link. – Second is, access the database tables using database managers like “dbadmin” or phpMyAdmin. 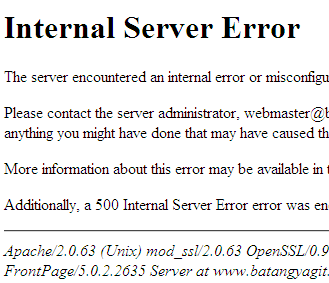 Your web host should provide you with a link to this. Open the “wp_users” table and edit the row corresponding to the admin user and enter the new password in the password field, but before doing that you will need to convert the password using any MD5 hashing function and enter the converted string as the password. The number ‘1’ corresponds to the Admin user in WordPress. Then upload back the changed “wp-config” file and login using the new password.